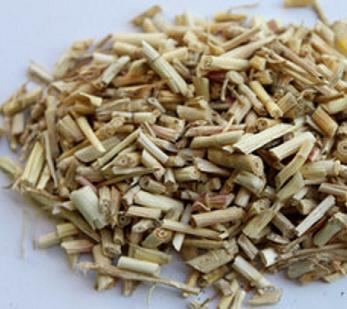 The rhizome of perennial herb Imperata cylindrica Beauv. var. major (Nees.) C. E. Hubb. of family Gramineae. Discarded its fibrous roots and membranous leaf sheath, washed and dried in the sun; sliced and unprocessed. Sweet, cold; lung, stomach and bladder meridians entered. Cool blood and stop bleeding, clear heat and induce diuresis. This herb is sweet in flavor, cold in nature, entering blood system, and has the action of clearing heat in blood system to stop bleeding. Therefore, it is indicated for various bleeding caused by blood heat. It is often used singly in decoction or taken the fresh juice after smashed or combined with other blood-cooling hemostatics. It is good at treating bleeding induced by fire and heat in the upper body. However, it is cold and descending in property, entering bladder meridian, and has actions of clearing heat and inducing diuresis, and guiding heat down. So it is quite favorable to hematuria and blood stranguria caused by accumulation of damp-heat in the bladder. When treating frequent hematuria by both deficiency and heat, it is combined with tonics. For instance it is combined with Ren Shen, Di Huang and Fu Ling in Mao Gen Yin Zi from Wai Tai Mi Yao (Arcane Essentials from the Imperial Library). 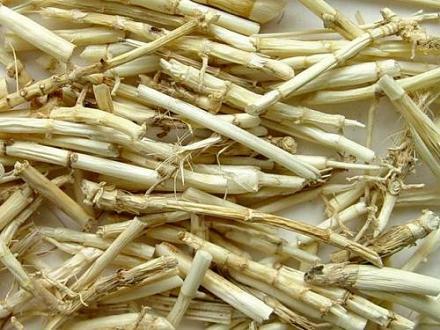 It has the actions of clearing heat and inducing diuresis to alleviate edema, relieving stranguria, excreting dampness and relieving jaundice. It is used by its single decoction or combined with other heat-clearing and damp-eliminating herbs. In addition it is indicated for emesis due to stomach heat because of the action of clearing stomach-heat to stop vomiting, as well as cough and dyspnea due to lung heat because of the action of clearing lung-heat to stop cough. Decoct 15~30 g and double the fresh. The fresh is better. The fresh juice could be taken directly. Use unprocessed and the charcoal stir-baked when stopping bleeding.